Debt.com » Credit FAQ: Answers to the Internet’s Top Credit Questions » What Do Identity Thieves Look For? Learn what information identity thieves target. Identity theft continues to grow in record numbers, with 16.7 million Americans experiencing it in 2017 alone according to Javelin. It is a complex and ever-changing issue since identity thieves are continuously finding new ways to steal and use personal information. So, what do identity thieves look for? Understanding more about it can help you take steps to avoid becoming a victim and learn what steps to take if your identity is stolen. Identity theft occurs when someone steals your personal information. Personally identifiable information (also known as PII) is information that can specifically identify an individual. This information includes your name, date of birth, Social Security number (SSN), address, credit card numbers, bank account numbers, phone number, and passwords. These terms mean slightly different things, although the two are often related. Identity fraud is the act of someone pretending to be another individual or using their information for financial gain. Identity theft is simply the act of gaining unauthorized access to personal information. The Federal Trade Commission (FTC) releases an annual publication every March called their Sentinel Report that reviews the previous year’s findings about issues consumers face in the marketplace. In 2017, they received over 2.7 million reports overall with 1.1 million of those being fraud reports. 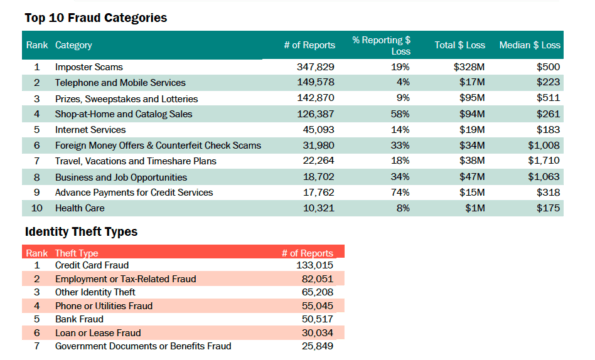 Of those fraud reports, 21% reported a monetary loss. The FTC says losses totaled $905 million in 2017, with an average loss of $429. The monetary losses hit people of all ages and several types of identity theft and fraud grew, including credit card fraud which rose 23%. In addition to the obvious financial impact, victims of identity theft and identity fraud often report experiencing emotional and mental issues, according to The Identity Theft Resource Center (ITRC). These negative emotional impacts also can have physical consequences, with 84.1% of victims the ITRC surveyed reporting issues with their sleep habits and 77.3% reporting increased stress levels. What Kind of Information Do Identity Thieves Look For? Identity thieves use a variety of information. This personal information is increasingly bought and sold by criminals on the dark web. The dark web is any area online not reachable by search engines. Not all sites on the dark web are hubs for criminal activity, but the anonymity of it encourages thieves to use it when trying to get your PII. Any of these pieces of information are fair game for identity thieves, though some are more valuable than others: SSN, date of birth, credit card numbers, driver’s license number, Social Security card, passwords and usernames, rewards account numbers, and more. Identity thieves use various tactics such as phishing, hacking, or buying information on the dark web. Sometimes they may even piece together pieces of information from various people to create a new fake identity, which is known as synthetic identity theft. Theft can also be very low tech, including mail theft and dumpster diving. It’s common to throw out information with account numbers, credit card offers, and other details about you and your family. Shredding documents and using a locked mailbox or P.O. box can help prevent this. In addition, make sure you aren’t leaving outgoing mail in an unsecured mailbox. Other types of theft can also lead to identity theft or fraud, such as a stolen wallet or documents taken from your glove compartment in your car. Data breaches are on the rise. Every time information is hacked or stolen, there’s a possibility that information could end up on the dark web or in the hands of a criminal. Information from data breaches can be bought and sold for years. This can cause identity theft or fraud long after the actual breach. For example, when you enter information on a website, look for a lock in the top left of your browser and HTTPS in the website address or URL. This indicates that the website is secure. Is the information really necessary or required? Sometimes there are fields in a form or application that aren’t really required. It’s okay to ask if something is a requirement and understand why the information is necessary before handing it over. It’s key to providing access to important information such as tax returns, pay stubs, accounts, and more. You can’t easily change your SSN if it’s compromised like you can with a credit card number. Do always ask if the SSN is a requirement and why it’s necessary. Don’t share your SSN over email. Don’t provide your SSN to someone on an incoming call. If someone suggests they’re calling from one of your financial institutions and they need it, you can always ask why and get the company name, details, and phone number. Then, contact your financial institution at the customer service number listed on their main website to confirm. Don’t put your SSN on any forms or applications. If you’re asked for it and feel that the request is valid, you can add it in later. Some common scenarios when you’ll need to provide your SSN include: opening a new financial account, filing taxes, starting a new job (for the tax paperwork such as a W9 or W2). Identity thieves can do a variety of things with your personal info depending on the pieces of data they have access to. 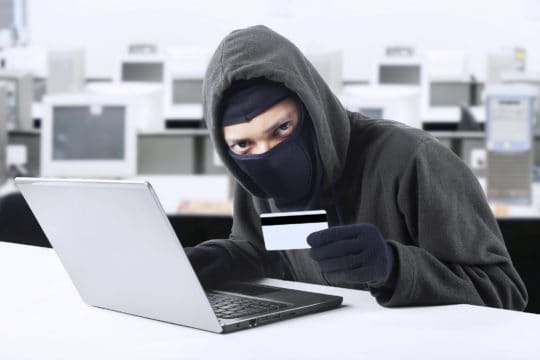 These actions include applying for new credit, changing your account information so communications and payments go to their account or address, accessing accounts to change passwords, getting you to send them money unknowingly by providing account or credit card information, scamming you out of money under the guise of paying a bill or handling a collection, and more. Unfortunately, thieves invent new scams and types of theft all the time. Thieves commonly use your SSN and birthdate to open new credit card or loan accounts in your name. Additionally, SSNs enable thieves to file and collect a tax return in your name. Many companies are putting more checks in place. State tax agencies often contact you before issuing a refund if you submit using a new address, especially one out of state. According to Javelin, child identity theft is a growing issue with over 1 million children becoming victims of identity theft in 2018. Financial losses from child identity theft hit $2.6 billion and cost families $540 million out of their own pockets. Children are easy targets since they don’t usually have credit histories. Thus, child identity theft can go undetected for longer. A child’s SSN could be used to open a new credit card account or loan and when charges rack up and go unnoticed, they can take a lot of time to clear up down the road. Avoid giving out your personal information over the phone (unless you’ve called the customer service phone number on the main website) and via email. Using secure online channels and apps is the best method to share these details. Regularly monitor all financial accounts and your credit report. Use a credit monitoring product to give you alerts when something changes. Freeze your credit with each of the three major credit reporting bureaus (Equifax, Experian, and Transunion). You will need to contact each bureau separately. Put a fraud alert on your credit file so that banks or financial institutions know to reach out to you before approving a new account. Identity theft is a major issue and can have huge financial implications, as well as impact other areas of your life. Read more here about identity theft to make sure you’re taking steps to protect yourself and know what steps to take if your identity is stolen.